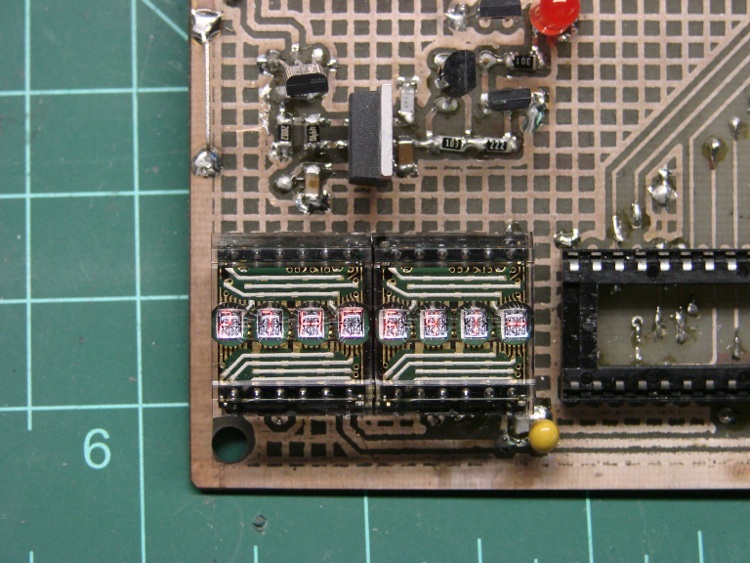 While I was putting together the Tek 492 memory board reader, I though it’d be a nice idea to add a small display. While the Arduino has USB serial I/O, the update rate is fairly pokey and an on-board display can provide more-or-less real time status. The 0.112″ high characters of the DL1414T gives readability up to eight feet. The user can build a display that enhances readability over this distance by proper filter selection. I think that distance is exceedingly optimistic. However, I needed to see only a few feet to the benchtop. Even better, adding the displays required no additional hardware: the SPI-driven shift registers on the board already had address and data lines, plus a pair of unused bits for the write strobes. What’s not to like? 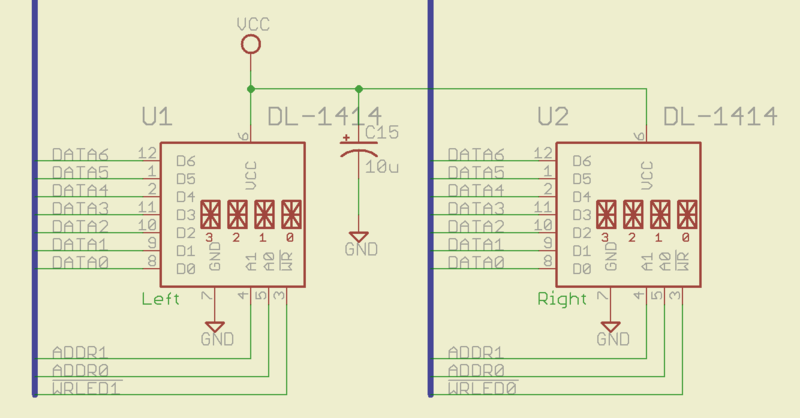 This schematic connects to the one you just clicked on; the two big blue bus lines are the same bus as in that schematic. If you don’t have anything else riding the data bus, adding a pullup on the D7 bit that isn’t used by these displays will make all the bits float high; the DL-1414s seem to pull their inputs upward. That came in handy when I was debugging the EPROM-burning code, because reading data without an EPROM in the socket produced 0xff, just like an erased EPROM byte. The two displays are the dark-red rectangle in the lower-right of the first picture, covered with a snippet of the Primary Red filter described there. These closeups, without and with the filter, demonstrate why you really, really need a filter of some sort. 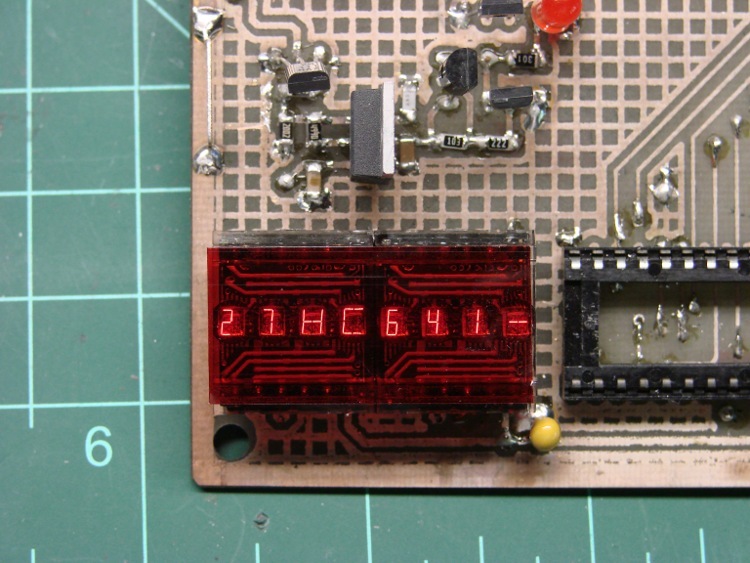 Using the displays is straightforward, given the hardware-assisted SPI code from there. 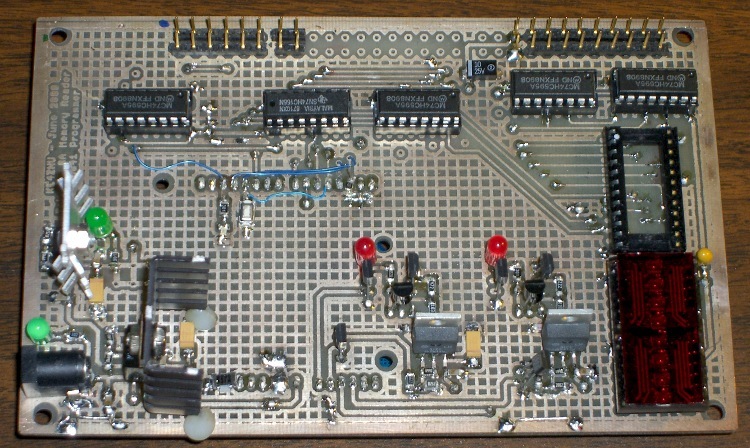 You could actually do it with just the I/O pins on an Arduino board, but you wouldn’t be able to do anything else. If you don’t have any other SPI registers, you could get away with a pair of HC595 outputs: 7 data + 2 address + 2 strobes + 5 outputs left over for something else. digitalWrite(PIN_DISABLE_DO,LOW);      // show the data!